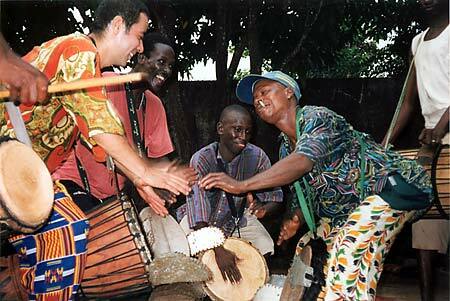 Past and current contents of this site ©1999-2003 the Chicago Djembe Project. May not be re-used or reprinted in any form without permission. NOTE FROM CDP: These pages were created for Nansedy Keita and Sayon Camara's first visit to North America in November-December of 2002. The workshops and performances were very successful and enjoyable. We hope to bring Nansedy and Sayon back in the future. Watch this space for updates, including photos from their workshops and performances in Chicago in 2002. December 2001: Nansedy and Sayon's traditional ensemble wakes up Simbaya, a suburb of Conakry, Guinea, the morning of the end of Karim. 2nd from left: Sayon Camara, 4th from left: Nansedy Keita. 50th Street & Dorchester Ave.
"I have great confidence in my nephew Nansedy's knowledge. These workshops and performances will be a splendid representation of the unique musical heritage of the Malinke people." Can't go to Guinea this year to study traditional African Djembe Drumming? We're bringing the best of Guinea to you! Master Drummer Famoudou Konate's nephew Nansedy Keita, the Second Soloist in his performing ensemble, will lead three intensive djembe/dundun workshops in Chicago the weekend after Thanksgiving. He'll be assisted by talented fellow Konate apprentice Sayon Camara. CLICK HERE FOR COMPLETE BIOS OF THE INSTRUCTORS. Each intensive, 3-hour workshop is double the typical U.S. workshop length. You'll learn an entire Malinke rhythm in each workshop, including dundun (bass drum) parts, djembe accompaniments, dundun/djembe echauffements ("heating up" to end a solo), and solo patterns. It's the comprehensive approach to djembe instruction pioneered by our mentor, Famoudou Konate. All 3 workshops are for dedicated beginner-to-intermediate levels. Each workshop is self-contained, and different rhythms will be taught in each. Bring your djembe. There will be dunduns available for workshop use, but if you own dunduns, bells and/or drum sticks/beaters, please bring them. All participants will learn and play the bass drum parts as well as the djembe during the workshops. Audio taping is permitted for students' personal use. No video-taping. Registration deadline for checks and money orders: Wednesday, November 27. After Wednesday, cash only at the door. Cancellations requested after Wednesday, November 27 subject to $20-per-workshop cancellation fee. No refunds on or after the day of the workshop. Nansedy and Sayon are planning to bring djembes for sale. Check with us before the workshops for availability. CDP also has copies of Famoudou Konate's classic Berlin Museum CD for sale. Cash sales only. FOR A LIST OF HOTELS AND MOTELS IN CHICAGO.